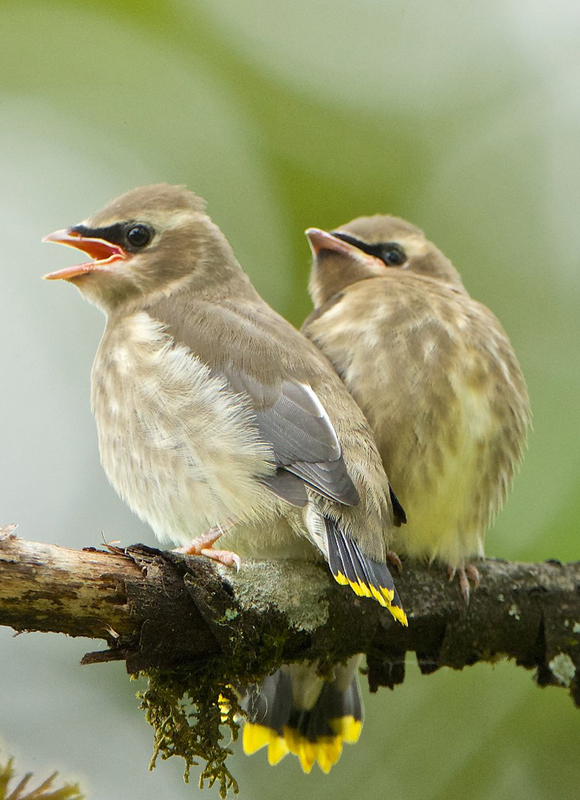 Fledgling Cedar Waxwing await food from a parent. Cedar Waxwings eat predominantly fruit, especially in winter. As is the case with fruit-eaters, their distribution is unpredictable and largely dependent on the location and abundance of fruiting plants like serviceberry and mulberry (in summer) and mistletoe and madrone (in winter). Their breeding season is also later in the summer (early June - early August) to take advantage of when fruits ripen. About four eggs are laid and, when the young hatch, the parents catch insects to feed the nestlings for the first few days. After Day 3, more fruit is introduced into their diet. The young will leave the nest after two weeks although the parents will still feed them for about another week. Listen to BirdNote shows about Cedar Waxwings.